VOL. 2/ISSUE 28 THURSDAY, MAY 15, 201435 cents Angels land in VeroMitch Kloorfain/chief photographer from far and wide to gather at Brevard reunion Mary KemperSTAFF WRITERmkemper@veteranvoiceweekly.comSee REUNION page 2 It was a weekend for meeting up with old friends, enjoying good food and music but most importantly, paying trib ute to fellow veterans. Tens of thousands attended the Florida Vietnam and All Veterans of Brevard Reunion in Melbournes Wickham Park through Sunday, May 4, a gathering that marked its 27th year. Though the opening ceremony took place on Saturday, May 3, events began on April 27 when the Traveling Vietnam Veterans Memorial Wall was emplaced on the park grounds. On April 28, the presentation of wreaths was made, and the opening ceremony for the Wall was conducted. Live music and a wide as days until Saturdays opening ceremony, which included a Massing of the Colors. 2 MAY 15, 2014 VETERAN VOICE THE VOICE OF EXPERIENCE Most people are familiar with the Wounded Warrior Project, but few have heard of the Semper Fi Fund. ed by Marine Corps spouses nine years ago to aid combat-wounded veterans and their families from all services with immediate support. Elks Lodge 2658, Port St. Lucie, last week presented a donation of $300 to the Jack Ivy Detachment of the Marine Corps league, rep resented by Marine Corps veteran Dan DePagnier. As long as there are veterans, we will always care, said the Lodges exalted ruler, Bill LaSalla. Hugh DePuis, president of the Space Coast Chapter of the Gen eral Motors Retirees Club, which organized the presentation, said he was glad to aid the Semper Fi Fund. to Semper Fi Fund Mary KemperSTAFF WRITERmkemper@veteranvoiceweekly.comSee FUND page 5 REUNIION from page 1 Retired Army Sgt. 1st Class Melvin Morris, Medal of Honor recipient, was a key guest. (Editors note: See previous cover age of Morris in Veteran Voice) Also on Saturday was a Last Patrol re-enactment, in authen tic uniforms and equipment. On Sunday, a church service was held, and the closing ceremo ny was held at the Traveling Wall. The Wall was, throughout, the centerpiece of the reunion. There was never a moment when people werent viewing it. Volunteers helped locate loved ones location on the Wall, and handed out complimentary sheets of thin paper and pencils so people could make rubbings of their loved ones names. 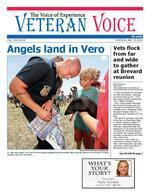 Greg Welsh is the Wall manag er for the Vietnam Veterans of Brevard. The former Air Force master ser geant and Vietnam veteran said the VVB created the Wall from funds we raised at one of our reunions. We introduced it to the public he said. Since then, weve trav eled the whole country with it. Its a pretty big job. Why does he do it? Because its important to get the Wall out to people, he said. Not everyone can get to Wash ington, D.C., (to see the perma nent memorial). Veterans are entitled to see their memorial, after everything theyve gone through. Welsh said the next stop is Jackson, Miss., and then 15 more stops are planned through December. Many people were clearly moved at the Wall. Karen Baker, of Columbus, of a classmate from Marian Franklin High School, Joseph Danison. on the ground in front of it. Even after all these years, she said, after composing herself. But you know, when you care about someone, it never really leaves you. He was such a won derful guy. Danison married a younger classmate just before deploying to Vietnam, Baker said. Mementos abounded in front of stuffed teddy bears, photos, and six-packs or single bottles of beer, among many different items. People need a chance to grieve at the Wall, said reunion director Ralph Earrusso. An Army veteran, Earrusso served in Phu Bai from 1968 to 1970. Im just here to make my broth ers happy. If they cant walk to see the Wall, well carry them, he said. When I see all the people here 99 percent of whom are vet erans seeing them be happy this is why I was allowed to come back (from Vietnam), he said. Earrusso has been the director of the reunion for 25 of its 27 years. I might hand it over to someone else next year, he said, but I cant seem to get anyone pinned down just yet. The reunion is an enormously popular event. Weve got the campground booked already through next year, Earrusso said. He estimated that 75,000 to 100,000 will have attended this year. Our event pays for itself as we go, he said. We dont get any grants, and we dont have corporate sponsors. If we did, then (Wickham Park) could dictate how they want things to run, and we want to do it our own way. Earrusso said details on next years reunion will be posted on ansreunion.com, in the coming months.